Ian-Malcolm Rijsdijk is a senior lecturer in the Centre for Film and Media Studies, and director of the African Cinema Unit at the University of Cape Town. He has published widely on the filmmaker Terrence Malick (the subject of his PhD), as well as South African film, wildlife documentary and literary fiction. He is currently working on early South African cinema and South Africa imagined in international films. As Director of the African Cinema Unit, he teaches in the MA in African Cinema and is also involved in developing postgraduate scholarship in African and South African screen studies. 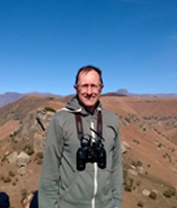 He teaches a postgraduate course on Film and Environment and is a registered contributor to the South African Bird Atlas Project. In 2013, he received a Distinguished Teacher’s Award from the University of Cape Town.